Dimensions : H : 1.25 in. X W : 1.50 in. These little shot tankards are National Football League collectibles. During the 1980,s these tankards were sold as gum ball machine novelties at the staggering price of .50 cents. WHO DAT ! WHO DAT !! WHO DAT !!! This one goes out to all you Saints fans with a toast from the B.L.A.S.T. Museum ! Culture : Who Dat Nation !! SHOUT OUT IF YOU LOVE NEW ORLEANS, NFL FOOTBALL, AND THE SAINTS !!! 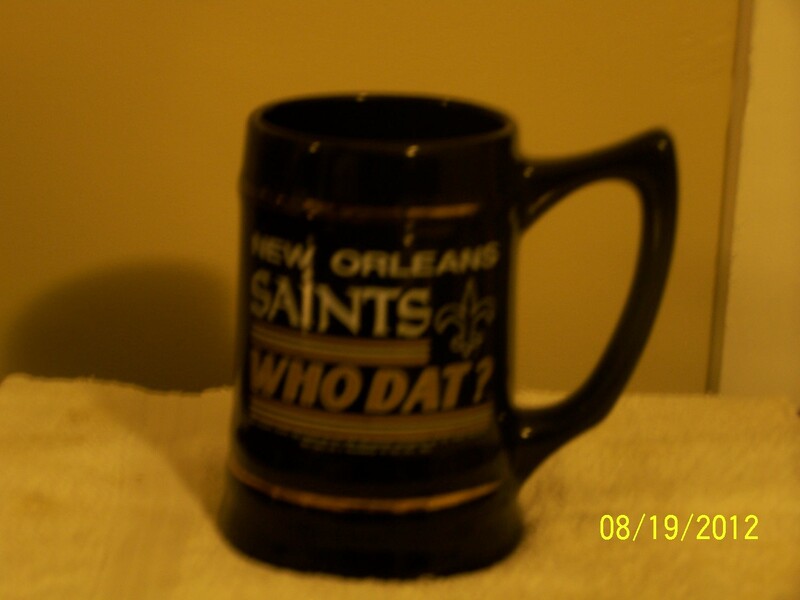 HERE’S TO THE NEW ORLEANS SAINTS AND NFL FOOTBALL !! WHO DAT ! WHO DAT ! WHO DAT !! !